Products include Tank Safety Equipment: Tank Pressure & Vacuum Vents, Deflagration Arrestors, Detonation Arrestors, Emergency Vents, Gauge Hatches, Tank Blanketing Valves & Thermal Trip Valves. Click the above picture to download a brochure. For help with your applications, contact us! Duncan Company now represents Yeary Controls in Minnesota, North Dakota, Eastern South Dakota & Wisconsin. Yeary Controls specializes in the development, integration, and application of innovative valve technologies. Yeary has focused on valve solutions for the energy and process industries for over 40 years. They offer a range of control valves and accessories in sizes form 1/2″ up to 48″. We can help you with your applications! The SME Minnesota Conference is the leading conference for regional collaboration and growth in the mining industry, specifically in the iron ore industry. Network with hundreds of your peers, gain exclusive access to the brightest minds in the mineral industry, participate in technical sessions, check out the latest products and most advanced solutions on the market. Ball Valve: One-piece, trunnion mounted style, ideal for severe duty application. 2-way, 3-way valve configurations. Hy-lok High Pressure cone and thread fittings offer the capability to reach extreme high pressures (up to 60,000 PSI). Cone and thread fittings are available in a Medium Pressure design, High Pressure design, and a Sour Gas option to meet your flow systems requirements. 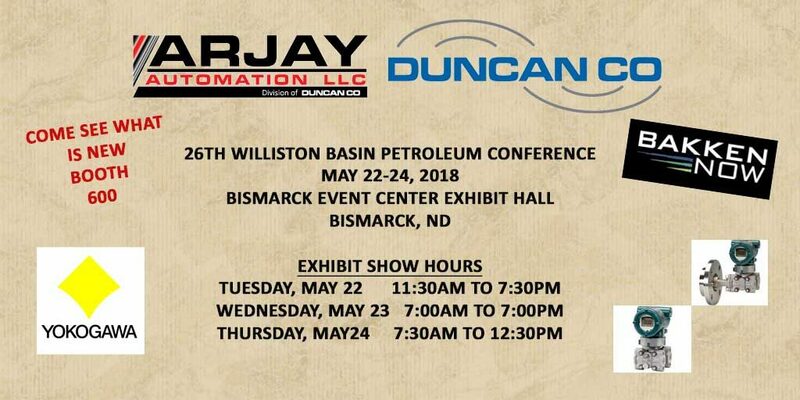 Arjay Automation, Division of Duncan Company will be exhibiting at the MN Power Systems Conference (MIPSYCON) on Tuesday, November 6th at RiverCentre – Hall A (175 W. Kellogg Blvd, St Paul, MN). Event Hours are 4:30pm – 7:00pm. Stop by to see what is new and how we can help solve your problems! Duncan’s New Space Saving Mounting kit for Jamesbury® HPBFV now available! Comments Off on Duncan’s New Space Saving Mounting kit for Jamesbury® HPBFV now available! 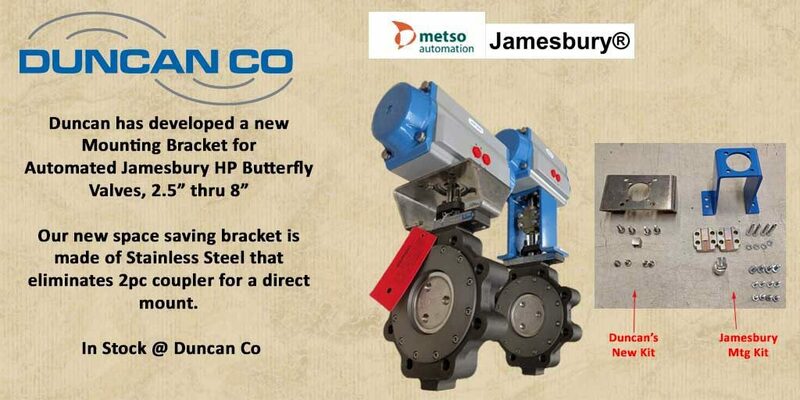 Duncan Company has developed a new Space Saving Mounting kit for the Jamesbury® High Performance Butterfly valves for sizes 2.5 thru 8 inch. This new bracket is made of Stainless Steel that eliminates the 2pc coupler for a direct mount. (On a 4″ valve, the difference in space is almost 4″ in height). Duncan will be stocking these and for large projects we can get them within 7 working days, if needed. There is a lot of Pros and almost no Cons moving to this mounting kit style. Contact us today for more information at sales@duncanco.com. Accuseal™ manufactures Severe Service metal-seated ball valves for a wide variety of tough applications in Power Plants, Refineries, Chemical Plants and Paper Mills. Accuseal™ isolation valves are designed and manufactured to provide tight shutoff in high temperature, high pressure, erosive, corrosive, abrasive and high-cycle applications. Available in 1/2in to 36in, 150# to 4500# Class, with unidirectional or bidirectional shutoff. Optimized ball and seat geometry and Omni-lap 360 assure tight shutoff and maximize valve life.